You ever get one of those odors in your fridge that you just cannot get rid of not matter what you try? Well that is what has been going on with our fridge since last week. I don’t know what it is or where it is coming from but the odor will just not leave. I did a search high and low for any products that were expired or just didn’t look right. I removed a couple of items and then washed down and wiped some of the surfaces. The next day the odor was still there. I then decided to replace the baking soda boxes that were there with new ones. I gave them a couple of days and yes the odor was still there. No I have heard about these stubborn odors before but have never experienced them first hand. I even read on one web forum how someone actually had to throw out his or her refrigerator because the odor got into the Styrofoam insulation. I didn’t want to be that person since our refrigerator is fairly new and expensive. Well for some reason, guess you can call it fate I was contacted by a company that sells Ionic Deodorizers. The company called Oransi contacted me about reviewing their Ionic Fridge Air Purifier. I was like what are you able to read my mind or something. How did you know I had a stink going on in my fridge? All joking aside I was happy to hear from them and eager to give their fridge deodorizer a try as soon as possible. Several days later the little fella arrived in the mail. I say little because it is a little smaller than a can of soda or a size of a large lemon. See picture below. The Ionic Fridge Air Purifier required 2 AA batteries and then you just push the button and put it in the fridge. After 1 day of being in the fridge the odor was greatly reduced. After several days the odor was barely noticeable. And after a week my fridge was back to smelling like a fridge. Whatever that means. The bottom line the stench from hell was no longer there and that is all that mattered to me. I would highly recommend this product from Oransi if you are having an odor control problem in your fridge. They say it also works on closets and other small-enclosed areas. Please feel free to check out their web site Oransi (www.oransi.com) for more info and and find what other other product they sell. The ionic fridge air purifier retails for $29 and it has free shipping offer. 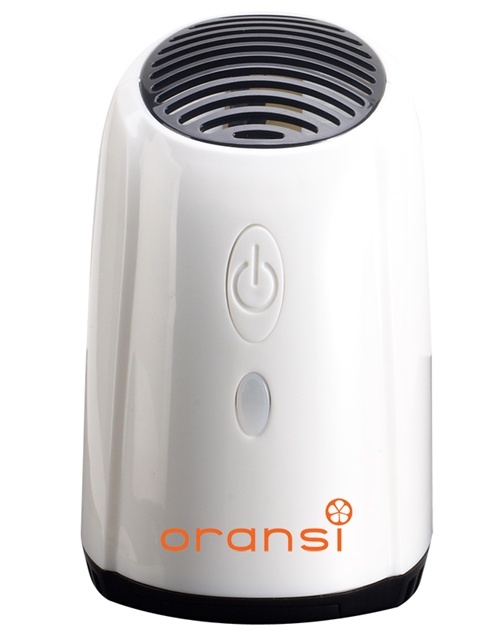 Disclaimer: The Ionic Fridge air purifier was provided to us by Oransi for free in order to test out the product. The views expressed in this review are mine and mine alone. Please tell me how do you deal with odors in your refrigerator? 🙂 Would anyone be interested in Ionic Fridge Air purifier giveaway? I have have few people interested I will set up a Flash giveaway. « Splash Down Beach, one soaking day to remember!